Diphenhydramine is an antihistamine mainly used to treat allergies. It is also used for insomnia, symptoms of the common cold, tremor in parkinsonism, and nausea. It is used by mouth, injection into a vein, and injection into a muscle. Maximal effect is typically around two hours after a dose, and effects can last for up to seven hours. Common side effects include sleepiness, poor coordination, and an upset stomach. Its use is not recommended in babies. There is no clear risk of harm when used during pregnancy; however, use during breastfeeding is not recommended. It is a first generation H1-antihistamine and works by blocking certain effects of histamine. Diphenhydramine is also an anticholinergic. Diphenhydramine was first made by George Rieveschl and came into commercial use in 1946. It is available as a generic medication. The wholesale price in the developing world as of 2014[update] is about US$0.01 per dose. In the United States, it costs less than US$25 for a typical month’s supply. It is sold under the trade name Benadryl, among others. In 2016 it was the 210th most prescribed medication in the United States with more than 2 million prescriptions. Diphenhydramine is a first-generation antihistamine used to treat a number of conditions including allergic symptoms and itchiness, the common cold, insomnia, motion sickness, and extrapyramidal symptoms. Diphenhydramine also has local anesthetic properties, and has been used as such in people allergic to common local anesthetics such as lidocaine. Diphenhydramine is effective in treatment of allergies. As of 2007[update], it was the most commonly used antihistamine for acute allergic reactions in the emergency department. By injection it is often used in addition to epinephrine for anaphylaxis. Its use for this purpose had not been properly studied as of 2007[update]. Its use is only recommended once acute symptoms have improved. Topical formulations of diphenhydramine are available, including creams, lotions, gels, and sprays. These are used to relieve itching and have the advantage of causing fewer systemic effects (e.g., drowsiness) than oral forms. Diphenhydramine is used to treat Parkinson's disease–like extrapyramidal symptoms caused by antipsychotics. Because of its sedative properties, diphenhydramine is widely used in nonprescription sleep aids for insomnia. The drug is an ingredient in several products sold as sleep aids, either alone or in combination with other ingredients such as acetaminophen (paracetamol) in Tylenol PM or ibuprofen in Advil PM. Diphenhydramine can cause minor psychological dependence. Diphenhydramine can cause sedation and has also been used as an anxiolytic. Diphenhydramine also has antiemetic properties, which make it useful in treating the nausea that occurs in vertigo and motion sickness. Diphenhydramine is not recommended for people older than 60 or children under the age of six, unless a physician is consulted. These populations should be treated with second-generation antihistamines such as loratadine, desloratadine, fexofenadine, cetirizine, levocetirizine, and azelastine. Due to its strong anticholinergic effects, diphenhydramine is on the "Beers list" of drugs to avoid in the elderly. Diphenhydramine is category B in the FDA Classification of Drug Safety During Pregnancy. It is also excreted in breast milk. Paradoxical reactions to diphenhydramine have been documented, in particular among children, and it may cause excitation instead of sedation. Topical diphenhydramine is sometimes used especially for people in hospice. This use is without indication and topical diphenhydramine should not be used as treatment for nausea because research does not indicate this therapy is more effective than alternatives. The most prominent side effect is sedation. A typical dose creates driving impairment equivalent to a blood-alcohol level of 0.10 which is higher than the 0.08 limit of most drunk driving laws. Diphenhydramine is a potent anticholinergic agent. This activity is responsible for the side effects of dry mouth and throat, increased heart rate, pupil dilation, urinary retention, constipation, and, at high doses, hallucinations or delirium. Other side effects include motor impairment (ataxia), flushed skin, blurred vision at nearpoint owing to lack of accommodation (cycloplegia), abnormal sensitivity to bright light (photophobia), sedation, difficulty concentrating, short-term memory loss, visual disturbances, irregular breathing, dizziness, irritability, itchy skin, confusion, increased body temperature (in general, in the hands and/or feet), temporary erectile dysfunction, and excitability, and although it can be used to treat nausea, higher doses may cause vomiting. Some people have an allergic reaction to diphenhydramine in the form of hives. However, restlessness or akathisia can also be a side effect made worse by increased levels of diphenhydramine, especially with recreational dosages. As diphenhydramine is extensively metabolized by the liver, caution should be exercised when giving the drug to individuals with hepatic impairment. Anticholinergic use later in life is associated with an increased risk for cognitive decline and dementia among older people. Acute poisoning can be fatal, leading to cardiovascular collapse and death in 2–18 hours, and in general is treated using a symptomatic and supportive approach. Diagnosis of toxicity is based on history and clinical presentation, and in general specific levels are not useful. Several levels of evidence strongly indicate diphenhydramine (similar to chlorpheniramine) can block the delayed rectifier potassium channel and, as a consequence, prolong the QT interval, leading to cardiac arrhythmias such as torsades de pointes. No specific antidote for diphenhydramine toxicity is known, but the anticholinergic syndrome has been treated with physostigmine for severe delirium or tachycardia. Benzodiazepines may be administered to decrease the likelihood of psychosis, agitation, and seizures in people who are prone to these symptoms. Alcohol may increase the drowsiness caused by diphenhydramine. Values are Ki (nM), unless otherwise noted. The smaller the value, the more strongly the drug binds to the site. Diphenhydramine, while traditionally known as an antagonist, acts primarily as an inverse agonist of the histamine H1 receptor. It is a member of the ethanolamine class of antihistaminergic agents. By reversing the effects of histamine on the capillaries, it can reduce the intensity of allergic symptoms. It also crosses the blood–brain barrier and inversely agonizes the H1 receptors centrally. Its effects on central H1 receptors cause drowsiness. Like many other first-generation antihistamines, diphenhydramine is also a potent antimuscarinic (a competitive antagonist of muscarinic acetylcholine receptors) and, as such, at high doses can cause anticholinergic syndrome. The utility of diphenhydramine as an antiparkinson agent is the result of its blocking properties on the muscarinic acetylcholine receptors in the brain. Diphenhydramine also acts as an intracellular sodium channel blocker, which is responsible for its actions as a local anesthetic. Diphenhydramine has also been shown to inhibit the reuptake of serotonin. It has been shown to be a potentiator of analgesia induced by morphine, but not by endogenous opioids, in rats. The drug has also been found to act as an inhibitor of histamine N-methyltransferase (HNMT). Oral bioavailability of diphenhydramine is in the range of 40% to 60%, and peak plasma concentration occurs about 2 to 3 hours after administration. The primary route of metabolism is two successive demethylations of the tertiary amine. The resulting primary amine is further oxidized to the carboxylic acid. The elimination half-life of diphenhydramine has not been fully elucidated, but appears to range between 2.4 and 9.3 hours in healthy adults. A 1985 review of antihistamine pharmacokinetics found that the elimination half-life of diphenhydramine ranged between 3.4 and 9.3 hours across five studies, with a median elimination half-life of 4.3 hours. A subsequent 1990 study found that the elimination half-life of diphenhydramine was 5.4 hours in children, 9.2 hours in young adults, and 13.5 hours in the elderly. Diphenhydramine is a diphenylmethane derivative. Analogues of diphenhydramine include orphenadrine, an anticholinergic, nefopam, an analgesic, and tofenacin, an antidepressant. Diphenhydramine can be quantified in blood, plasma, or serum. Gas chromatography with mass spectrometry (GC-MS) can be used with electron ionization on full scan mode as a screening test. GC-MS or GC-NDP can be used for quantification. Rapid urine drug screens using immunoassays based on the principle of competitive binding may show false-positive methadone results for people having ingested diphenhydramine. Quantification can be used to monitor therapy, confirm a diagnosis of poisoning in people who are hospitalized, provide evidence in an impaired driving arrest, or assist in a death investigation. 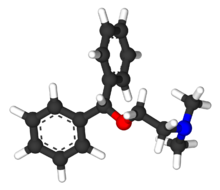 Diphenhydramine was discovered in 1943 by George Rieveschl, a former professor at the University of Cincinnati. In 1946, it became the first prescription antihistamine approved by the U.S. FDA. In the 1960s diphenhydramine was found to inhibit reuptake of the neurotransmitter serotonin. This discovery led to a search for viable antidepressants with similar structures and fewer side effects, culminating in the invention of fluoxetine (Prozac), a selective serotonin reuptake inhibitor (SSRI). A similar search had previously led to the synthesis of the first SSRI, zimelidine, from brompheniramine, also an antihistamine. Diphenhydramine is sometimes used recreationally as potentiator of opiates. Diphenhydramine is deemed to have limited abuse potential in the United States owing to its potentially serious side-effect profile and limited euphoric effects, and is not a controlled substance. Since 2002, the U.S. FDA has required special labeling warning against use of multiple products that contain diphenhydramine. In some jurisdictions, diphenhydramine is often present in postmortem specimens collected during investigation of sudden infant deaths; the drug may play a role in these events. Diphenhydramine is among prohibited and controlled substances in the Republic of Zambia, and travelers are advised not to bring the drug into the country. Several Americans have been detained by the Zambian Drug Enforcement Commission for possession of Benadryl and other over-the-counter medications containing diphenhydramine. Although diphenhydramine is widely used and generally considered to be safe, multiple cases of abuse and addiction have been documented. Because the drug is cheap and sold over the counter in most countries, adolescents without access to stronger, illicit drugs are particularly at risk. People with mental health problems—especially those with schizophrenia—are also prone to abuse the drug, which is self-administered in large doses to treat extrapyramidal symptoms caused by the use of antipsychotics. Recreational users report calming effects, mild euphoria, and hallucinations as the desired effects of the drug. Research has shown that antimuscarinic agents, such as diphenhydramine, "may have antidepressant and mood-elevating properties." A study conducted on adult males with a history of sedative abuse found that subjects who were administered a high dose (400 mg) of diphenhydramine reported a desire to take the drug again, despite also reporting negative effects, such as difficulty concentrating, confusion, tremors, and blurred vision. Diphenhydramine is marketed under the trade name Benadryl by McNeil Consumer Healthcare in the U.S., Canada, and South Africa. Trade names in other countries include Dimedrol, Daedalon, and Nytol. It is also available as a generic medication. Procter & Gamble markets an over-the-counter formulation of diphenhydramine as a sleep aid under the brand ZzzQuil. In 2014 this product had annual sales of over $120 million and had a 29.3% share of the $411 million sleep-aid market category. ^ "Showing Diphenhydramine (DB01075)". DrugBank. Archived from the original on 31 August 2009. Retrieved 5 September 2009. ^ a b c d e Paton DM, Webster DR (1985). "Clinical pharmacokinetics of H1-receptor antagonists (the antihistamines)". Clinical Pharmacokinetics. 10 (6): 477–97. doi:10.2165/00003088-198510060-00002. PMID 2866055. ^ a b AHFS Drug Information. Published by authority of the Board of Directors of the American Society of Hospital Pharmacists. 1990. ^ a b Simons KJ, Watson WT, Martin TJ, Chen XY, Simons FE (July 1990). "Diphenhydramine: pharmacokinetics and pharmacodynamics in elderly adults, young adults, and children". Journal of Clinical Pharmacology. 30 (7): 665–71. doi:10.1002/j.1552-4604.1990.tb01871.x. PMID 2391399. ^ a b Garnett WR (February 1986). "Diphenhydramine". American Pharmacy. NS26 (2): 35–40. PMID 3962845. ^ a b c d e f g h i "Diphenhydramine Hydrochloride". Drugs.com. American Society of Health-System Pharmacists. 6 September 2016. Archived from the original on 15 September 2016. Retrieved 28 September 2016. ^ "Diphenhydramine Pregnancy and Breastfeeding Warnings". Drugs.com. Archived from the original on 2 October 2016. Retrieved 28 September 2016. ^ Ayd, Frank J. (2000). Lexicon of Psychiatry, Neurology, and the Neurosciences. Lippincott Williams & Wilkins. p. 332. ISBN 978-0-7817-2468-5. Archived from the original on 8 September 2017. ^ Dörwald, Florencio Zaragoza (2013). Lead Optimization for Medicinal Chemists: Pharmacokinetic Properties of Functional Groups and Organic Compounds. John Wiley & Sons. p. 225. ISBN 978-3-527-64565-7. Archived from the original on 2 October 2016. ^ "Benadryl". Ohio History Central. Archived from the original on 17 October 2016. Retrieved 28 September 2016. ^ "Diphenhydramine". International Drug Price Indicator Guide. Retrieved 28 September 2016. ^ Hamilton, Richart (2015). Tarascon Pocket Pharmacopoeia 2015 Deluxe Lab-Coat Edition. Jones & Bartlett Learning. p. 240. ISBN 978-1-284-05756-0. ^ "Diphenhydramine Hydrochloride Monograph". Drugs.com. The American Society of Health-System Pharmacists. Archived from the original on 15 June 2011. ^ Brown HE, Stoklosa J, Freudenreich O (December 2012). "How to stabilize an acutely psychotic patient" (PDF). Current Psychiatary. 11 (12): 10–16. Archived from the original (PDF) on 14 May 2013. ^ Smith DW, Peterson MR, DeBerard SC (August 1999). "Local anesthesia. Topical application, local infiltration, and field block". Postgraduate Medicine. 106 (2): 57–60, 64–6. doi:10.3810/pgm.1999.08.650. PMID 10456039. ^ a b American Society of Health-System Pharmacists. "Diphenhydramine Hydrochloride". Drugs.com. Archived from the original on 15 September 2016. Retrieved 2 August 2016. ^ a b Banerji A, Long AA, Camargo CA (2007). "Diphenhydramine versus nonsedating antihistamines for acute allergic reactions: a literature review". Allergy and Asthma Proceedings. 28 (4): 418–26. doi:10.2500/aap.2007.28.3015. PMID 17883909. ^ Young WF (2011). "Chapter 11: Shock". In Humphries RL, Stone CK (eds.). CURRENT Diagnosis and Treatment Emergency Medicine,. LANGE CURRENT Series (Seventh ed.). McGraw–Hill Professional. ISBN 978-0-07-170107-5. ^ Sheikh A, ten Broek VM, Brown SG, Simons FE (January 2007). "H1-antihistamines for the treatment of anaphylaxis with and without shock". The Cochrane Database of Systematic Reviews (1): CD006160. doi:10.1002/14651858.CD006160.pub2. PMID 17253584. ^ Aminoff MJ (2012). "Chapter 28. Pharmacologic Management of Parkinsonism & Other Movement Disorders". In Katzung B, Masters S, Trevor A (eds.). Basic & Clinical Pharmacology (12th ed.). The McGraw-Hill Companies, Inc. pp. 483–500. ISBN 978-0-07-176401-8. ^ Monson K, Schoenstadt A (8 September 2013). "Benadryl Addiction". eMedTV. Archived from the original on 4 January 2014. ^ Dinndorf PA, McCabe MA, Frierdich S (August 1998). "Risk of abuse of diphenhydramine in children and adolescents with chronic illnesses". The Journal of Pediatrics. 133 (2): 293–5. doi:10.1016/S0022-3476(98)70240-9. PMID 9709726. ^ Flake ZA, Scalley RD, Bailey AG (March 2004). "Practical selection of antiemetics". American Family Physician. 69 (5): 1169–74. PMID 15023018. Archived from the original on 24 March 2016. Retrieved 10 March 2016. ^ Medical Economics (2000). Physicians' Desk Reference for Nonprescription Drugs and Dietary Supplements, 2000 (21st ed.). Montvale, NJ: Medical Economics Company. ISBN 978-1-56363-341-6. ^ Schroeck JL, Ford J, Conway EL, Kurtzhalts KE, Gee ME, Vollmer KA, Mergenhagen KA (November 2016). "Review of Safety and Efficacy of Sleep Medicines in Older Adults". Clinical Therapeutics. 38 (11): 2340–2372. doi:10.1016/j.clinthera.2016.09.010. PMID 27751669. ^ a b c Brunton L, Chabner B, Knollmann B (2011). "Chapter 32. Histamine, Bradykinin, and Their Antagonists". In Brunton L (ed.). Goodman & Gilman's The Pharmacological Basis of Therapeutics (12e ed.). McGraw Hill. pp. 242–245. ISBN 978-0-07-162442-8. ^ "High risk medications as specified by NCQA's HEDIS Measure: Use of High Risk Medications in the Elderly" (PDF). National Committee for Quality Assurance (NCQA). Archived from the original (pdf) on 1 February 2010. ^ "2012 AGS Beers List" (PDF). The American Geriatrics Society. Retrieved 27 November 2015. ^ Black RA, Hill DA (June 2003). "Over-the-counter medications in pregnancy". American Family Physician. 67 (12): 2517–24. PMID 12825840. ^ Spencer JP, Gonzalez LS, Barnhart DJ (July 2001). "Medications in the breast-feeding mother". American Family Physician. 64 (1): 119–26. PMID 11456429. ^ a b de Leon J, Nikoloff DM (February 2008). "Paradoxical excitation on diphenhydramine may be associated with being a CYP2D6 ultrarapid metabolizer: three case reports". CNS Spectrums. 13 (2): 133–5. doi:10.1017/s109285290001628x. PMID 18227744. Smith TJ, Ritter JK, Poklis JL, Fletcher D, Coyne PJ, Dodson P, Parker G (May 2012). "ABH gel is not absorbed from the skin of normal volunteers". Journal of Pain and Symptom Management. 43 (5): 961–6. doi:10.1016/j.jpainsymman.2011.05.017. PMID 22560361. Weschules DJ (December 2005). "Tolerability of the compound ABHR in hospice patients". Journal of Palliative Medicine. 8 (6): 1135–43. doi:10.1089/jpm.2005.8.1135. PMID 16351526. ^ "Diphenhydramine Side Effects". Drugs.com. Archived from the original on 24 January 2009. Retrieved 6 April 2009. ^ Heine A (November 1996). "Diphenhydramine: a forgotten allergen?". Contact Dermatitis. 35 (5): 311–2. doi:10.1111/j.1600-0536.1996.tb02402.x. PMID 9007386. ^ Coskey RJ (February 1983). "Contact dermatitis caused by diphenhydramine hydrochloride". Journal of the American Academy of Dermatology. 8 (2): 204–6. doi:10.1016/S0190-9622(83)70024-1. PMID 6219138. ^ Salahudeen MS, Duffull SB, Nishtala PS (March 2015). "Anticholinergic burden quantified by anticholinergic risk scales and adverse outcomes in older people: a systematic review". BMC Geriatrics. 15 (31): 31. doi:10.1186/s12877-015-0029-9. PMC 4377853. PMID 25879993. Archived from the original on 3 June 2016. ^ "Diphenhydramine overdose:". MedlinePlus Medical Encyclopedia. U.S. National Library of Medicine. Archived from the original on 30 May 2013. ^ a b Manning B (2012). "Chapter 18. Antihistamines". In Olson K (ed.). Poisoning & Drug Overdose (6th ed.). McGraw-Hill. ISBN 978-0-07-166833-0. Retrieved 19 March 2013. ^ Khalifa M, Drolet B, Daleau P, Lefez C, Gilbert M, Plante S, O'Hara GE, Gleeton O, Hamelin BA, Turgeon J (February 1999). "Block of potassium currents in guinea pig ventricular myocytes and lengthening of cardiac repolarization in man by the histamine H1 receptor antagonist diphenhydramine". The Journal of Pharmacology and Experimental Therapeutics. 288 (2): 858–65. PMID 9918600. ^ Cole JB, Stellpflug SJ, Gross EA, Smith SW (December 2011). "Wide complex tachycardia in a pediatric diphenhydramine overdose treated with sodium bicarbonate". Pediatric Emergency Care. 27 (12): 1175–7. doi:10.1097/PEC.0b013e31823b0e47. PMID 22158278. ^ "Diphenhydramine and Alcohol / Food Interactions". Drugs.com. Archived from the original on 17 February 2013. ^ Zimatkin SM, Anichtchik OV (1999). "Alcohol-histamine interactions". Alcohol and Alcoholism. 34 (2): 141–7. doi:10.1093/alcalc/34.2.141. PMID 10344773. ^ Roth BL, Driscol J. "PDSP Ki Database". Psychoactive Drug Screening Program (PDSP). University of North Carolina at Chapel Hill and the United States National Institute of Mental Health. Retrieved 14 August 2017. ^ a b c Tatsumi M, Groshan K, Blakely RD, Richelson E (December 1997). "Pharmacological profile of antidepressants and related compounds at human monoamine transporters". European Journal of Pharmacology. 340 (2–3): 249–58. doi:10.1016/s0014-2999(97)01393-9. PMID 9537821. ^ a b c d e f g h i j k l m n o p q Krystal AD, Richelson E, Roth T (August 2013). "Review of the histamine system and the clinical effects of H1 antagonists: basis for a new model for understanding the effects of insomnia medications". Sleep Medicine Reviews. 17 (4): 263–72. doi:10.1016/j.smrv.2012.08.001. PMID 23357028. ^ Tsuchihashi H, Sasaki T, Kojima S, Nagatomo T (1992). "Binding of [3H]haloperidol to dopamine D2 receptors in the rat striatum". J. Pharm. Pharmacol. 44 (11): 911–4. PMID 1361536. ^ Ghoneim OM, Legere JA, Golbraikh A, Tropsha A, Booth RG (October 2006). "Novel ligands for the human histamine H1 receptor: synthesis, pharmacology, and comparative molecular field analysis studies of 2-dimethylamino-5-(6)-phenyl-1,2,3,4-tetrahydronaphthalenes". Bioorganic & Medicinal Chemistry. 14 (19): 6640–58. doi:10.1016/j.bmc.2006.05.077. ^ Gantz I, Schäffer M, DelValle J, Logsdon C, Campbell V, Uhler M, Yamada T (1991). "Molecular cloning of a gene encoding the histamine H2 receptor". Proc. Natl. Acad. Sci. U.S.A. 88 (2): 429–33. PMC 50824. PMID 1703298. ^ Lovenberg TW, Roland BL, Wilson SJ, Jiang X, Pyati J, Huvar A, Jackson MR, Erlander MG (June 1999). "Cloning and functional expression of the human histamine H3 receptor". Molecular Pharmacology. 55 (6): 1101–7. PMID 10347254. ^ a b Liu C, Ma X, Jiang X, Wilson SJ, Hofstra CL, Blevitt J, Pyati J, Li X, Chai W, Carruthers N, Lovenberg TW (March 2001). "Cloning and pharmacological characterization of a fourth histamine receptor (H(4)) expressed in bone marrow". Molecular Pharmacology. 59 (3): 420–6. doi:10.1124/mol.59.3.420. PMID 11179434. ^ a b c d e Bolden C, Cusack B, Richelson E (February 1992). "Antagonism by antimuscarinic and neuroleptic compounds at the five cloned human muscarinic cholinergic receptors expressed in Chinese hamster ovary cells". The Journal of Pharmacology and Experimental Therapeutics. 260 (2): 576–80. PMID 1346637. ^ a b Kim YS, Shin YK, Lee C, Song J (October 2000). "Block of sodium currents in rat dorsal root ganglion neurons by diphenhydramine". Brain Research. 881 (2): 190–8. doi:10.1016/S0006-8993(00)02860-2. PMID 11036158. ^ Suessbrich H, Waldegger S, Lang F, Busch AE (April 1996). "Blockade of HERG channels expressed in Xenopus oocytes by the histamine receptor antagonists terfenadine and astemizole". FEBS Letters. 385 (1–2): 77–80. doi:10.1016/0014-5793(96)00355-9. PMID 8641472. ^ a b Khilnani G, Khilnani AK (September 2011). "Inverse agonism and its therapeutic significance". Indian Journal of Pharmacology. 43 (5): 492–501. doi:10.4103/0253-7613.84947. PMC 3195115. PMID 22021988. ^ Lopez AM (10 May 2010). "Antihistamine Toxicity". Medscape Reference. WebMD LLC. Archived from the original on 13 October 2010. ^ a b c Domino EF (1999). "History of modern psychopharmacology: a personal view with an emphasis on antidepressants". Psychosomatic Medicine. 61 (5): 591–8. doi:10.1097/00006842-199909000-00002. PMID 10511010. ^ Carr KD, Hiller JM, Simon EJ (February 1985). "Diphenhydramine potentiates narcotic but not endogenous opioid analgesia". Neuropeptides. 5 (4–6): 411–4. doi:10.1016/0143-4179(85)90041-1. PMID 2860599. ^ Horton JR, Sawada K, Nishibori M, Cheng X (October 2005). "Structural basis for inhibition of histamine N-methyltransferase by diverse drugs". Journal of Molecular Biology. 353 (2): 334–344. doi:10.1016/j.jmb.2005.08.040. PMC 4021489. PMID 16168438. ^ a b Taylor KM, Snyder SH (May 1972). "Histamine methyltransferase: inhibition and potentiation by antihistamines". Molecular Pharmacology. 8 (3): 300–10. PMID 4402747. ^ a b c Pragst F (2007). "Chapter 13: High performance liquid chromatography in forensic toxicological analysis". In Smith RK, Bogusz MJ (eds.). Forensic Science (Handbook of Analytical Separations). 6 (2nd ed.). Amsterdam: Elsevier Science. p. 471. ISBN 978-0-444-52214-6. ^ Rogers SC, Pruitt CW, Crouch DJ, Caravati EM (September 2010). "Rapid urine drug screens: diphenhydramine and methadone cross-reactivity". Pediatric Emergency Care. 26 (9): 665–6. doi:10.1097/PEC.0b013e3181f05443. PMID 20838187. ^ Hevesi D (29 September 2007). "George Rieveschl, 91, Allergy Reliever, Dies". The New York Times. Archived from the original on 13 December 2011. Retrieved 14 October 2008. ^ "Benadryl". Ohio History Central. Archived from the original on 5 September 2015. Retrieved 13 August 2015. ^ Ritchie J (24 September 2007). "UC prof, Benadryl inventor dies". Business Courier of Cincinnati. Archived from the original on 24 December 2008. Retrieved 14 October 2008. ^ Awdishn RA, Whitmill M, Coba V, Killu K (October 2008). "Serotonin reuptake inhibition by diphenhydramine and concomitant linezolid use can result in serotonin syndrome". Chest. 134 (4 Meeting abstracts). doi:10.1378/chest.134.4_MeetingAbstracts.c4002. ^ Barondes SH (2003). Better Than Prozac. New York: Oxford University Press. pp. 39–40. ISBN 978-0-19-515130-5. ^ Sandor I (30 July 2000). "Using Antihistamines, Anticholinergics, and Depressants To Potentiate Opiates, And Dealing With Opiate Side Effects". Antihistamine Aficionado Magazine. Archived from the original on 26 November 2010. ^ Food and Drug Administration, HHS (December 2002). "Labeling of diphenhydramine-containing drug products for over-the-counter human use. Final rule". Federal Register. 67 (235): 72555–9. PMID 12474879. Archived from the original on 5 November 2008. ^ Marinetti L, Lehman L, Casto B, Harshbarger K, Kubiczek P, Davis J (October 2005). "Over-the-counter cold medications-postmortem findings in infants and the relationship to cause of death". Journal of Analytical Toxicology. 29 (7): 738–43. doi:10.1093/jat/29.7.738. PMID 16419411. ^ Baselt RC (2008). Disposition of Toxic Drugs and Chemicals in Man. Biomedical Publications. pp. 489–492. ISBN 0-9626523-7-7. ^ "List of prohibited and controlled drugs according to chapter 96 of the laws of Zambia" (DOC). The Drug Enforcement Commission ZAMBIA. Archived from the original on 16 November 2013. ^ "Zambia". Country Information > Zambia. Bureau of Consular Affairs, U.S. Department of State. Archived from the original on 21 July 2015. Retrieved 17 July 2015. ^ Thomas A, Nallur DG, Jones N, Deslandes PN (January 2009). "Diphenhydramine abuse and detoxification: a brief review and case report". Journal of Psychopharmacology. 23 (1): 101–5. doi:10.1177/0269881107083809. PMID 18308811. ^ Forest E (27 July 2008). "Atypical Drugs of Abuse". Articles & Interviews. Student Doctor Network. Archived from the original on 27 May 2013. ^ a b Halpert AG, Olmstead MC, Beninger RJ (January 2002). "Mechanisms and abuse liability of the anti-histamine dimenhydrinate" (PDF). Neuroscience and Biobehavioral Reviews. 26 (1): 61–7. doi:10.1016/s0149-7634(01)00038-0. PMID 11835984. ^ Gracious B, Abe N, Sundberg J (December 2010). "The importance of taking a history of over-the-counter medication use: a brief review and case illustration of "PRN" antihistamine dependence in a hospitalized adolescent". Journal of Child and Adolescent Psychopharmacology. 20 (6): 521–4. doi:10.1089/cap.2010.0031. PMC 3025184. PMID 21186972. ^ Dilsaver SC (February 1988). "Antimuscarinic agents as substances of abuse: a review". Journal of Clinical Psychopharmacology. 8 (1): 14–22. doi:10.1097/00004714-198802000-00003. PMID 3280616. ^ Mumford GK, Silverman K, Griffiths RR (1996). "Reinforcing, subjective, and performance effects of lorazepam and diphenhydramine in humans". Experimental and Clinical Psychopharmacology. 4 (4): 421–430. doi:10.1037/1064-1297.4.4.421. ^ "Is P&G Preparing to Expand ZzzQuil?". Archived from the original on 11 February 2017. Retrieved 10 February 2017. Lieberman JA (2003). "History of the use of antidepressants in primary care" (PDF). Primary Care Companion J. Clinical Psychiatry. 5 (supplement 7): 6–10. Cox D, Ahmed Z, McBride AJ (March 2001). "Diphenhydramine dependence". Addiction. 96 (3): 516–7. doi:10.1046/j.1360-0443.2001.96350713.x. PMID 11310441. Björnsdóttir I, Einarson TR, Gudmundsson LS, Einarsdóttir RA (December 2007). "Efficacy of diphenhydramine against cough in humans: a review". Pharmacy World & Science. 29 (6): 577–83. doi:10.1007/s11096-007-9122-2. PMID 17486423. Wikimedia Commons has media related to Diphenhydramine.